An impressive wall map of London, England. An uncommon 1855 map of London and its immediate environs by G. F. Cruchley. 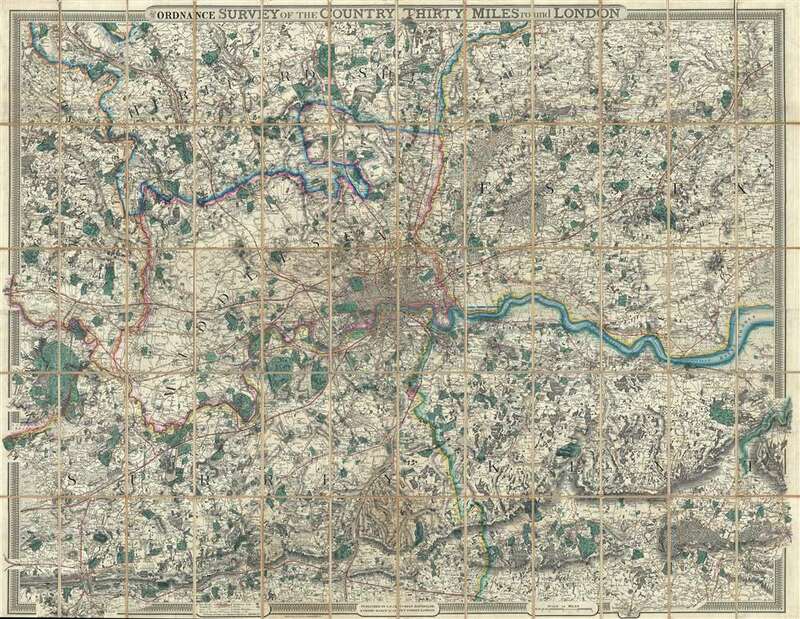 Presented here in case format, Cruchley's map covers the lands 30 miles around London, or from Hertford to Turnbridge and Godalming, and from Windsor to Chatham. Exceptionally vivid color work identifies counties, rail lines, roads, and forests. The detail throughout is extraordinary, with even such insignificant features as the ancient earthen embankments on Wimbledon common illustrated. Similarly market towns and market days are carefully identified throughout. Cruchley based this map on an earlier map issued by J. W. Froggett from 1831 to 1854. Cruchley must have acquired the map plates in that year, as the first Cruchley issue also dates to 1854. Published from Cruchley's offices at 81 Fleet Street, Lonodn. Victorian map historian Ralph Hyde identifies six states of this map, however, the present edition is not noted in the catalogs of nay of the major private or institutional collections that Hyde canvassed, singling its exceptionally rarity. Nontheless, although not noted by Hyde, the present example, based upon the date, must be considered the second edition, between Hyde 333-1 (1854) and 333-2 (1857). Very good. Backed on original linen. Folds into binder. Linen exhibits minor splits here and there, mostly near edges. Hyde, Ralph, Printed Maps of Victorian London, 1851 - 1900, 333 (this however is a scarce state not identified by Hyde, but fits between Hyde 333-1 and 333-2).